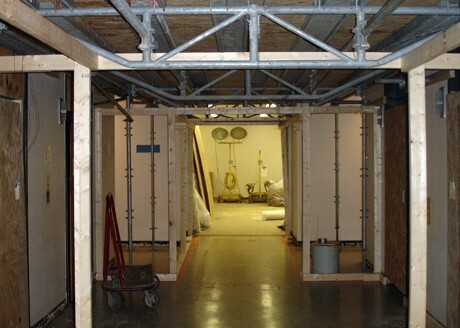 Cleveland State University needed to remove, and dispose of 16,000 square feet of asbestos-containing fireproofing and associated ceiling systems from the deck of the 10th-floor Data Center in Rhodes Tower. At the completion of the abatement work, an approved sprayback was applied to fire protect the area. The challenge was keeping the Rhodes Tower Data Center — which contained the university's campus-wide computer operations — accessible, so it could be maintained 24 hours a day without water infiltration and contamination. Precision tradesmen responded by creating an engineered, waterproof decking system which included post shores, wood bridging and a waterproof membrane to comply with the owners requirements. Further complications of the abatement activity involved maintaining required negative air while allowing the needed cooling of the computers. For this reason we engineered and fabricated special ducting to allow the two systems to co-exist. All work was completed within the owner time frame without any disruption to the critical activities of the university. The computer equipment was able to be accessed and operated throughout the project. 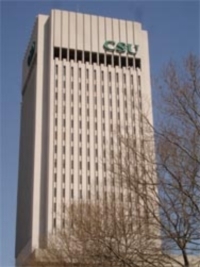 Removal, disposal, and replacement of 16,000 square feet of asbestos-containing fireproofing and associated ceiling systems from Rhodes Tower at Cleveland State University.